Heat Transfer: Current Applications of Air Conditioning deals with problems and applications of air conditioning. The discussions are organized around non-stationary heat transfer through walls; study of confined rooms or enclosures; calculation of cooling loads; heat transfer with two-phase refrigerants; measurement of thermal conductivity and water vapour permeability of insulating materials; and tests on air handling equipment (room air-conditioners, induction or fan coil air-conditioners). This book is comprised of 60 chapters and begins with an assessment of the unit-system controversy in the United States and the quest for an ultimate resolution. 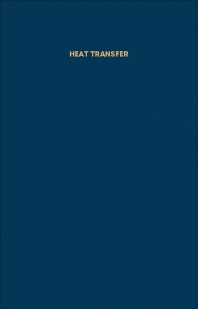 The following chapters explore the resolution of conductive heat transfer problems using the finite element method; thermal behavior of composite walls under transient conditions; thermal and electrical models for solving problems of non-stationary heat transfer through walls; and use of a radiometer to measure the average temperature of a wall. Experimental results for mixed air convection along a vertical surface are also presented. This monograph will be a valuable resource for electronics engineers. Time-Wise Persistence of Error in Presentation of Thermodynamic Data Such as on "Entropy"